Featuring entries composed by leading international scholars, The Encyclopedia of English Renaissance Literature presents comprehensive coverage of all aspects of English literature produced from the early 16th to the mid 17th centuries. Comprises over 400 entries ranging from 1000 to 5000 words written by leading international scholars. Provides coverage of canonical authors and their works, as well as a variety of previously under-considered areas, including women writers, broadside ballads, commonplace books, and other popular literary forms. Biographical material on authors is presented in the context of cutting-edge critical discussion of literary works. 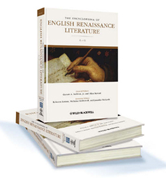 Represents the most comprehensive resource available for those working in English Renaissance literary studies.